1 Preheat the oven to 220C/Gas 7. Trim the courgettes and cut 2 of them into diagonal slices, about 1.5cm thick. Grate the third courgette on the medium-fine side of your grater, not too fine or too coarse if possible. You want it to be in fairly thin strands. Scoop up the grated courgette in your hands and squeeze out as much water as you can, then put it in a bowl. 2 Grate the cheese on the medium-fine setting of your grater – the same as the courgette – and add it to the courgette. 3 Cut the sundried tomatoes into rough 1cm chunks and add them to the bowl.Season with a pinch of salt and some freshly ground black pepper, then mix well. 4 Put the chicken breasts on a board and cut a 10cm slit in each one,horizontally. Cut almost all the way through so you can open the chicken breast like a book. 5 Divide the grated courgette mixture between the chicken breasts and close the 2 sides to hold the filling. This stuffing will help keep the chicken deliciously moist as it cooks. 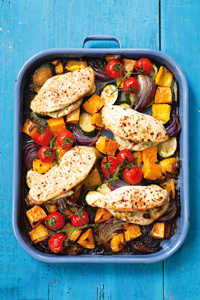 6 Put the sliced courgettes in a large roasting tin and add the red onion wedges, sweet potatoes and yellow peppers. Drizzle over the oil, season with salt and lots of freshly ground black pepper and toss together well. Nestle the stuffed chicken breasts among the vegetables, season with ground black pepper and sprinkle with the chilli flakes, if using. 7 Bake for 25 minutes. 8 Remove the pan from the oven and scatter in the cherry tomatoes. Put it back in the oven for another 10 minutes or until the chicken is cooked and the vegetables are tender and lightly browned.